Defenseman Shayne Gostisbehere has put 22 shots on goal this season. Slow starts in games plagued the Flyers in recent years, forcing them to chase their opponents. What is Gritty? A ‘lovable monster,’ the orange embodiment of Philly and the Flyers, or a brand marketing breakthrough? The Flyers (2-3) have played five games this season and have allowed the first goal in each of them. They will try to change that development when they host the Florida Panthers (0-2-1) at 7 Tuesday night. "We've talked about our starts, and I really liked our start on Saturday," coach Dave Hakstol said, referring to a 1-0 loss to Vegas. "I liked the intensity and how we played. … Now we have to follow that up and have a good start to tonight's hockey game." Center Scott Laughton said "playing with the pace we know we can play with" is especially critical at the outset of games. 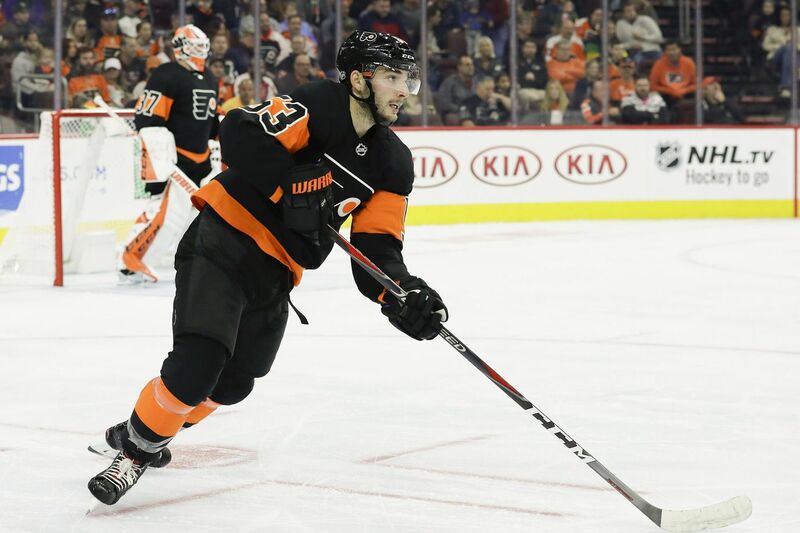 "I think we did that the last game and came up on the wrong side, but if we continue to play with that pace and speed and smothering defense, I think we'll be OK."
Saturday, the Flyers didn't allow a goal until 1 minute, 25 seconds remained in the game. But they have allowed too many early goals and have been outscored in the first period, 8-4. Florida's power play is 0 for 12, and its penalty kill has been successful on just 7 of 10 attempts (70 percent). The Flyers are 5 for 22 (22.7 percent) on the PP and have killed 10 of 14 (71.4 percent). Brian Elliott (3.80 GAA, .883 save percentage), coming off his best outing of the season, will start in goal for the Flyers. James Reimer (3.62, .885) is expected to get the call for the Panthers. Elliott's career numbers vs. Florida: 6-3 record, 2.41 GAA, .919 save percentage. Reimer's career stats vs. Flyers: 4-4-3 record, 2.51 GAA, .918 save percentage. Center Nolan Patrick skated again Tuesday and appears to be almost ready to return. It wouldn't be surprising if he's in the lineup Thursday in Columbus. Center/winger Corban Knight was activated, but Hakstol wouldn't say whether he will be in Tuesday's lineup. Knight's number was changed from 38 to 10. … Both teams have struggled in the third period — Florida has been outscored, 4-0, and the Flyers have been outscored, 8-4. … The Flyers have won the last four games against Florida at the Wells Fargo Center. … From Jan. 29 until the end of last season, the Panthers had a league-high 25 wins and tied Nashville with a NHL-best 52 points in that span. … Florida has lost each of its three games this season by one goal, falling to Tampa Bay (shootout), Columbus, and Vancouver. … The Flyers have lost three of their last four since an opening-night 5-2 victory in Vegas. … Shayne Gostisbehere has 22 shots on goal, second among NHL defensemen and tied for ninth overall. … Since the start of last season, Claude Giroux has 73 assists, the most of any NHL player in that span. Jake Voracek is tied for second with 71. … Travis Konecny is goal-less in five games but has hit iron three times. "He has to stay with what he's doing; he's getting good opportunities," Hakstol said.